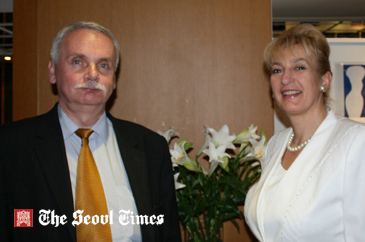 "Taste Flavor of Quality European Meat"
President Bozena Giacchini (right) of Polish-Korean Chamber of Commerce poses with Mr. Jerzy Rzymanek, director general of Polish-Korean Chamber of Commerce, in Seoul. Mr. Jerzy Rzymanek, director general of Polish-Korean Chamber of Commerce, his eight-member business delegation came to Seoul from Poland on Nov. 18, 2008 President Bozena Giacchini of Polish-Korean Chamber of Commerce led the Polish business delegation. They left Seoul for Poland on Nov. 23, 2008. The purpose of their visit is to participate in Gwangju International Food Fair 2008. Mr. Rzymanek and his delegation attended the grand opening ceremony of the food fair on Nov. 20, 2008. For that Mr. Rzymanek and his delegation went down to Gwangju on Nov. 19, 2008. "We also met with members of Gwangju Chamber of Commerce on the day for the promotion," said Mr. Rzymanek in a recent interview with The Seoul Times. 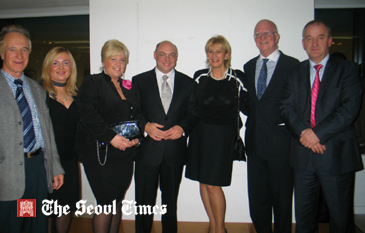 On Nov. 21, 2008 they came back to Seoul to take part in the Polish National Day reception which included a concert in downtown Seoul. "We are planning next year to join two important events," he said "One is Food & Hotel in May in Seoul, where we will have 100 sq. meters of exhibition space." He said he wants to present different kinds of meat products from Europe. For the purpose of promoting Polish meat and meat products in Korea, President Bozena Giacchini of Polish-Korean Chamber of Commerce signed an agreement with President Wieslaw Rozanski of Poland's Union of Producers & Employers of Meat Industry (UPEMI) on Nov. 12, 2008. The agreement was also co-signed by the under secretary of Ministry of Agriculture of Poland, said Mr. Rzymanek. "We believe that Korea is very good and promising market because you have very refined taste but you should be provided with more info about European meat," he said. In Poland 70 percent of farms are small and it means feeds are natural. He said that in Poland pigs are eating food feeds, a special kind of feed which is based on natural products such as wheat mixed with other ingredients like vegetables. "Pork chops are main Polish dish," he said. EU set aside 2.4 million Euros for promotional campaign this year, since it wants to promote two important markets — the US market and the Korean market. "EU wants to increase the share of European meat and meat products in Korean market," he said. "Next year we have two very important exhibitions —"Food & Hotel in Seoul" and "Gwangju International Food Fair 2009." 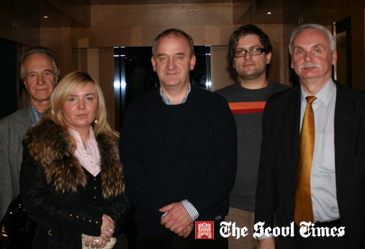 President Wieslaw Rozanski (right) of Poland's Union of Producers & Employers of Meat Industry (UPEMI) poses with EU Ambassador to Seoul Brian McDonald (2nd from right), President Bozena Giacchini (3rd from right) of Polish-Korean Chamber of Commerce, and other Polish business delegation members at a gathering in Seoul. Up to 60 member-delegation of Polish businesspeople will visit Seoul for the "Food & Hotel in Seoul" show slated for May next year, and some 40 Polish businesspeople plans to come to S. Korea to attend "Gwangju International Food Fair 2009." For this year's "Gwangju International Food Fair," the number of Polish delegation was only 20. "We are on a fact-finding mission for opening wider the distribution channels of Europeans meat and meat products particularly those of Poland." UPEMI President Rozanski met with Polish Ambassador to Seoul Marek Janusz Calka and EU Ambassador to Seoul Brian McDonald to brief them about our campaign for promoting European meat and meat products in the local Korean market. "We aim to promote European meat in this local Korean market," President Rozaski said. "Korean is the third largest market for Poland after Ukraine, and Russia." He said that pigs are produced in a very special and careful way. "Pigs are fed in Poland without the use of special chemicals or additives, like the one which makes pigs grow faster artificially," he said. "Pigs in his country are fed in traditional methods." Unlike other countries, 70 percent of meat products are carried out in small or medium-sized private farms. It takes at least one month longer than industrialized countries for pigs to grow as heavy as 100 kg. "It takes longer but meat tastes better," he said. When asked about the prices, he said "But prices are more or less the same, but quality is much better." "I am very much satisfied with the result of this trip," he said. "We met a lot of great people who want to help us, and we learned that there are good business opportunities in the Korean meat market." "We noticed that Korean people are interested in European kitchen," he said "We found that Korean society is becoming more and more wealthy and they are interested in changing their culinary habits." "We want to use this phenomenon by providing the right information about European cooking habits and tastes," he said. "We also want to attract the attention of Polish investors in opening the meat processing factories in Korea." He said that started this campaign two years ago for Ukraine, China, and Japan. "Now is the time for South Korea and the US." Among those countries, Ukraine is the most successful market so far, according to President Rozanski. President Wieslaw Rozanski (center) of Poland's Union of Producers & Employers of Meat Industry (UPEMI) poses with his fellow business delegation members at a Seoul hotel. 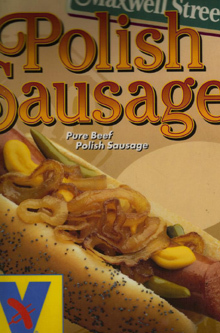 As one of the business tycoons back in Poland, President Rozanski runs three meat processing companies, and one slaughtering house. He also has two trading companies. 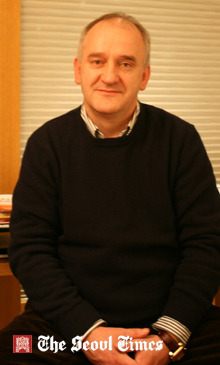 Previously Mr. Jerzy Rzymanek, director general of Polish-Korean Chamber of Commerce, served as faculty member of Warsaw University's law school from 1977 to 1997. Mr. Rzymanek is the fluent speaker of six languages — Czech, Slovak, Russian, French, English, as well as Polish.